We have just finished our latest series of cookery classes for older people. We had 12 gentleman join us for the 3 classes in Cornelia's Coffee Shop in St NIcholas' Church, Harpenden. Over the 3 weeks we made Chicken, Bacon and Tomato Cobbler, Victoria Sandwich Cake, Fish Pie, Apple Brown Betty, Quiche Lorraine and a Lemon Cheesecake. The course was very lively and everyone was very proud of what they achieved. The feedback was overwhelmingly positive and the most frequent comment was that they wished they could come every week! 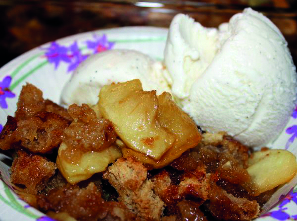 The recipe for our traditional, delicious and seasonal pudding Apple Brown Betty can be found below. 2. Peel ( if wished),core and chop the apples into small chunks. 7. Add the demerara sugar and cinnamon or other spices ( if using).